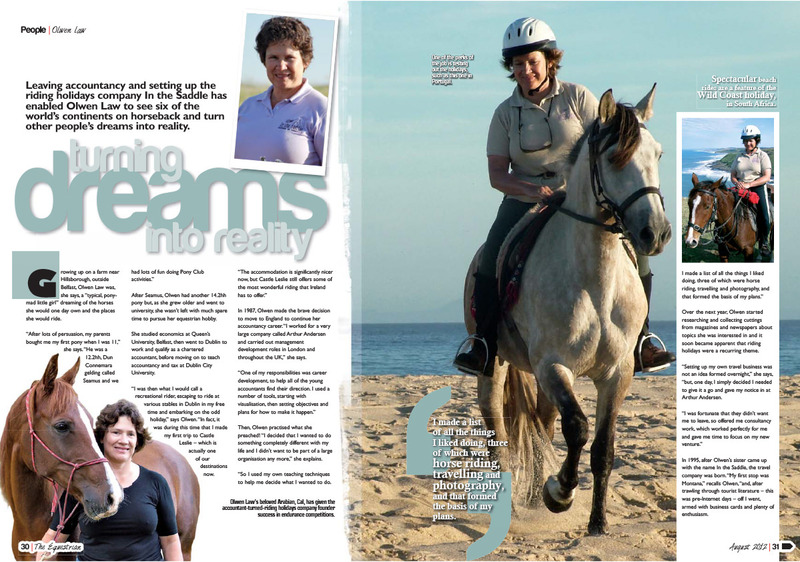 In The Saddle started in the early 1990’s with this simple idea “what great fun it would be to ride horses abroad”. I knew there were lots of countries with fabulous scenery and wonderful horses but how could you find out more about them? On a six month sabbatical to South America I had come across estancias and haciendas offering riding but it was all rather hit and miss, and just luck if you came across something of quality. This was in the days before the internet and back home information was mainly limited to high street agents and the travel supplements of the weekend papers. With a bit of investigation it soon became clear that there were plenty of hotels, lodges and guest houses that offered riding, either with their own horses or by linking up with nearby stables. The problem was how would you know what sort of riding experience you were in for: were the horses well cared for, would the guides look after you, will it be a case of hair raising gallops on prancing beasts or a bottom numbing follow the leader style pony trek. Then the metaphorical penny dropped, there are lots of people who enjoy riding and if only there was someone who had the knowledge and experience to help them decide which ride was right for them, maybe they would also like to go on riding holidays. With so many questions and virtually no answers there was only one thing for it, get on a plane and start looking. My first research trip was to Montana in 1995. With words of encouragement from the state tourist board (thank you Pam Gosing) I turned up at various ranches and spent many hours quizzing the owners and wranglers often from the back of horse. It was after returning from this visit that I knew the concept could work and In The Saddle was born. Many trips later In The Saddle has a portfolio of more than a hundred rides in over forty different countries. Over the years we have travelled the world met many amazing people and in the process discovered some fabulous places to ride. In The Saddle now offer every kind of riding holiday imaginable. There are trail rides, centre based rides, camping rides, 5* luxury rides, short breaks, expeditions, holidays for experienced riders, holidays for novice riders and even holidays for people who have never ridden before. The one common factor is you know you will be riding good quality horses and be looked after by knowledgeable, experienced guides. At our office in Shropshire we have a great team of dedicated and knowledgeable people all of whom have ridden extensively overseas. We produce the definitive guide to riding holidays, the Book of World Rides and we have stands at the main horse shows where we love to share our passion for riding holidays with whoever will listen. Still today at a show there will be someone who will come up to us and say, I didn’t know you could do this “what great fun it would be to ride horses abroad”.